The Calvin College Department of Art and Art History is proud to present “BOURN,” an exhibition by the 2015 Bachelor of Arts – Art Education students. 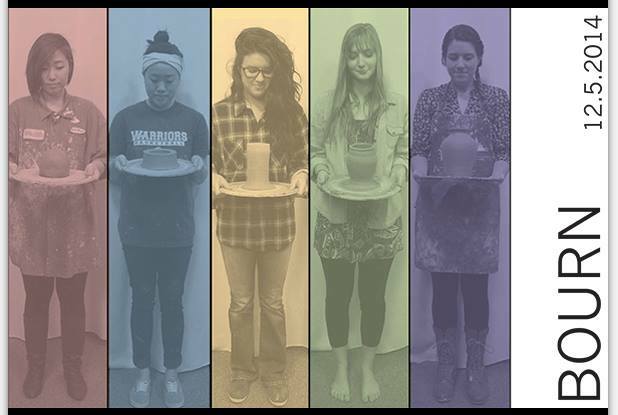 This exhibition represents the Art Education program at Calvin College and honors the work of five Art Education students who will complete their student teaching in the upcoming spring semester. Friday, December 5 • 6–9 p.m.
Meet the artists and enjoy the festive, cozy shopping experience along the Avenue for the Arts during the First Friday Holiday Edition. Handmade gifts, local shops and specials. Refreshments served. This entry was posted in Exhibition and tagged 106 Gallery, Art Education, exhibitions. Bookmark the permalink.